An icon of the American West, the heyday of the Stage Coach lasted from the mid nineteenth century to around 1900. A specialized vehicle, it was the off-road utility transport of its day. Traditional European road coaches quickly fell apart on the rough and often nonexistent roads of the American frontier. It was American coach builders; Abbott & Downing, based in Concord, New Hampshire, who created an innovative design to solve the problem. By using a leather through-brace system that allowed the coach to sway and absorb shock, Abbott & Downing built a coach that could withstand the riggers of frontier travel as well as giving passengers a comfortable ride. The Stage Coach, often seen spelled as one word Stagecoach, got its name from the stations or “stages” of its journey that were planned stops along the route. This allowed for changing teams of horses and for passengers to rest. Both city as well as long distance coaches were built. Abbott & Downing shipped their popular stage coaches as far away as Australia and South Africa. This particular coach is an accurate historic reproduction of the period. It was built in 1997 by Willi Green of Orient, Ohio, and was modeled after Abbot & Downing Coach #65 owned by Hugh Holbrook of Hamilton, Ohio, ID#71. The coach debuted at the 1997 CAA Conference in Estes Park, Colorado and was driven by Jean Paul Gautier with a team of six Friesian horses. That same year it was taken to Walnut Hill for a demonstration with outriders. 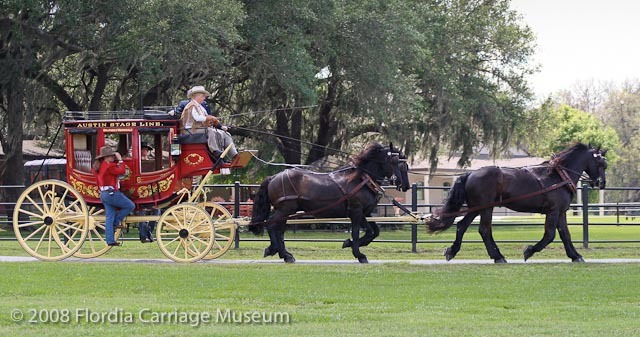 Since then, this stage coach has lived an active life at the Florida Carriage Museum and is used on regular occasions. John Parker, chairman of the British Driving Society, drove the coach in 2008 and enjoyed himself immensely. Of the 160 carriages in the collection, this is Gloria Austin’s favorite coach to drive. Concord coaches were brightly painted with local scenes and the names of their destinations. This coach carries the name “Austin Stage Line” in honor of Gloria Austin and is decorated with colorful scenes of Florida. It’s a “city coach” evidenced by the lack of seating for rooftop passengers. The distance covered by the stage line often dictated the number of horses pulling the coach; shorter distances used teams of four horses while longer journeys required a team of six. The lash of the coachman’s whip was too short to reach the leaders of the six so he would fill his pockets with pebbles to throw at them. Comments for "Concord Stage Coach"
Jeff Herbert on April 01, 2011 can you please tell me links with australia.eg,was there a factory in australia?were in australia were the concord stage coaches mainly used?